Flesh and the Devil (1927) is one of my favorite movies. It's so ridiculously glamorous--you could definitely watch it just for Greta Garbo's wardrobe. Flesh and the Devil is so awesome I completely forget I'm even watching a silent film. It's the story of two best friends, Leo (John Gilbert) and Ulrich (Lars Hanson). When the two of them arrive home on leave, Leo meets Felicitas (Greta Garbo) and becomes infatuated with her, ignoring Ulrich and Ulrich's little sister, Hertha (Barbara Kent) who's in love with Leo. Felicitas and Leo commence a very steamy affair but Leo doesn't know Felicitas is married until her husband walks in on them... Naturally, everything goes to hell in a handbasket and you'll have to watch it to see how it turns out. 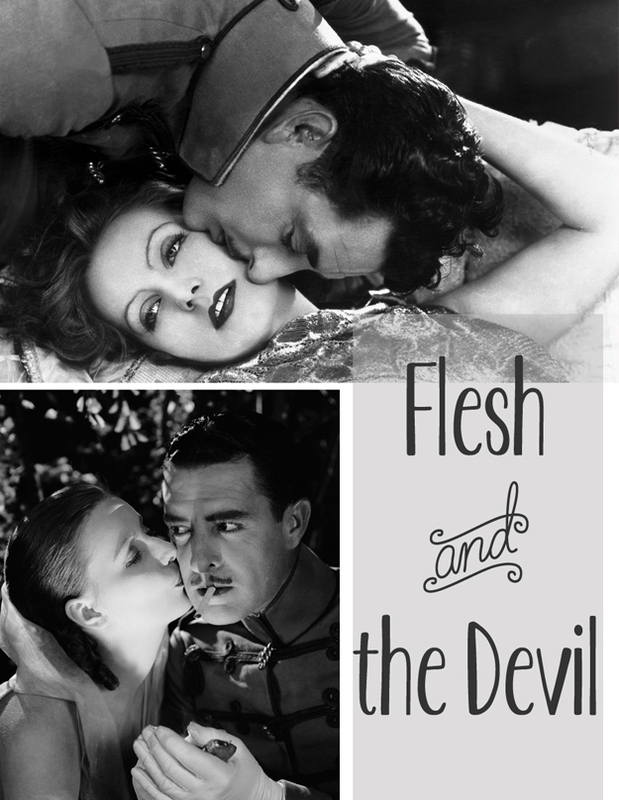 Flesh and the Devil is available on DVD as part of The Greta Garbo Signature Collection (it's only $25 now which is a steal and it's a fabulous collection of films). 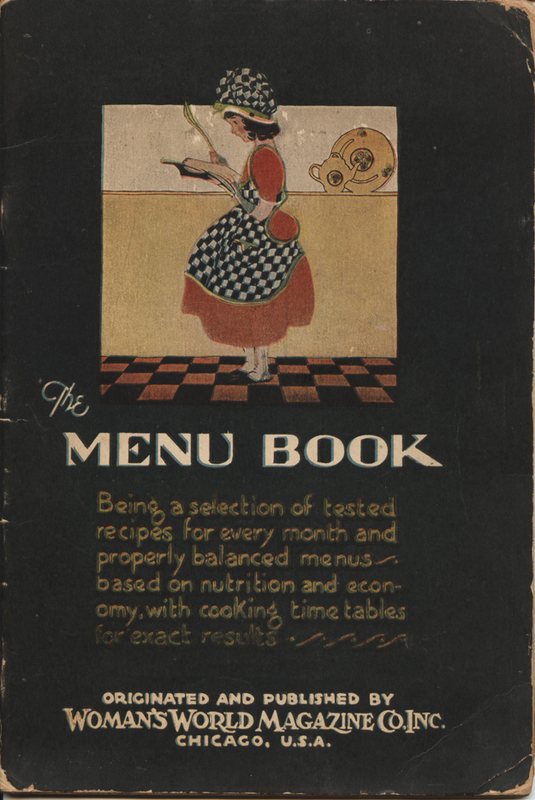 This scan is from my new (to me, at least--I don't think anyone would call 1928 "new") cookbook. It has a week of menus for every month: breakfast, lunch and dinner, which will give me a lot of material for the future! Anyway, I made everything except the Fruited Lemon Gelatine, since I already had a cake made. Preheat oven to 325 degrees Fahrenheit. Place the roast, fattiest side up, in a roasting pan and season well with salt and pepper. Place sage on top of pork. Halve the sweet potatoes and quarter the acorn squash half. Place around the roast and season with salt and pepper. If using large apples, core and place on top of the vegetables. (If using small apples, add them for the last 40 minutes of cooking.) Cook roast in the middle of the oven 45 to 50 minutes for each pound of pork. 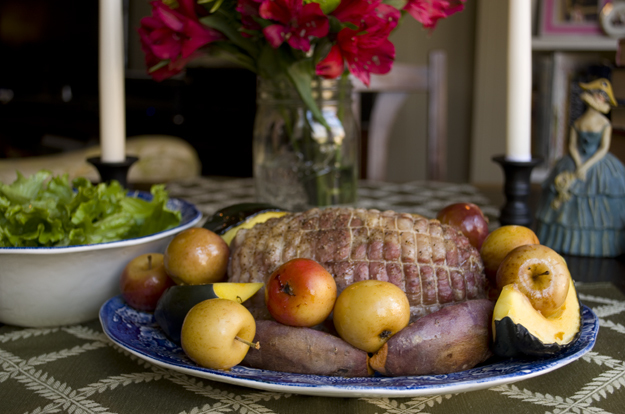 Take sage off the pork then remove pork, vegetables and apples to a carving board and tent with tin foil to keep warm. Let rest 15 minutes before carving. Use the drippings left in the roasting tin for gravy. Heat pan drippings and stock over high heat until boiling. Meanwhile make a slurry of the flour and 2 tablespoons of cold water. Add this mixture to the stock when it comes to a boil and whisk until gravy is desired thickness. Serve with roast pork and vegetables. Put all ingredients in a jar and shake to combine. Store in the refrigerator. Did you like this post? Please share it on facebook, pin it or tweet it! Subscribe to my mailing list and be sure to sign up for the monthly newsletter, as well. You'll get special subscriber-only content (like my classic movie recommendations of the month). Want to keep up with me in between blog posts? The best way to do that is by liking The Past on a Plate on facebook. Hope to see you there! Are you as obsessed as I am with the Jazz Age? 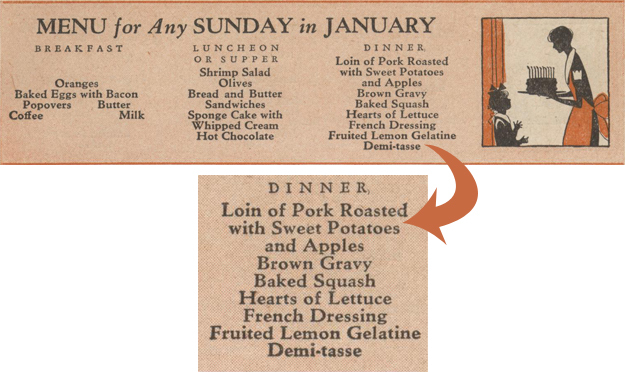 If you follow me on facebook, you'll know that I'm planning to tackle a week's worth (breakfast, luncheon, dinner) of menus from the March 1927 issue of American Cookery magazine. I'll be posting photos to facebook in real time and doing a wrap-up each day on the blog. I wanted to make it possible for you to follow along (or even cook along!) with me, so I'll be making the menus and all the recipes available as an e-book. Tentatively, I plan to do the event the last full week of March: Sunday the 24th through Saturday the 30th. As soon as it's ready, there will be a free St. Patrick's Day bonus e-booklet just for subscribers. It will be available in an upcoming newsletter, so sign up today! Definitely must see! Let me know what you think. Another must see film! Great find on the recipe book, too. It looks like it has really cute illustrations. It does have great illustrations. The 20s were really perfect for that! I so need to make that salad dressing. I'll pass the pork recipe on to the husband. It's come down in price a lot. Paul bought it for me for Christmas when it first came out and I think it was somewhere in the $50-$70 range. It's a really good deal now! I lo-o-o-o-o-ove John Gilbert. LOVE him. I was going to mention on FB the other day when you asked about everyone's favorite silents... have you seen 'The Big Parade'? I fell almost in love with Rene Adoree and John Gilbert as an onscreen coupe as Gilbert and Garbo (hard to believe, but true!). I am also upset that I have a lot of the movies in that collection, but not at that bargain basement fire sale price! Can't wait to see more of this menu in action! I sooooo want to see The Big Parade, but I've never gotten the chance. It's not even available on DVD which is really aggravating! Hopefully TCM will play it soon. Evidently, it's part of their film festival this year--maybe it will get a DVD release. I've only seen John Gilbert in Flesh and the Devil and Queen Christina. I'm definitely going to be devoting time now to rooting out more of his movies (and more silents in general). I also really desperately want to see Downstairs which isn't available on DVD, either. It's a shame. Hi Lauren, your blog looks beautiful! Yes, I am obsessed with the Jazz age, especially with the new film The Great Gatsby coming up soon. Love your menu which really seems to go with the film you featured. Oh if only I had time to catch up with all these great classic films. I will just have to make the time, they all look so good when you write about them! Neither your Dad or I have seen this one. Your picture is fabulous!